Today, however, transportation problems rank low on the list of concerns of San Franciscans. A January 2004 David Binder Research poll found that “traffic congestion” was a “major concern” for just two percent of San Francisco voters! Housing and homelessness represented two of the top four concerns of the new poll. While the news media are not paying attention to parking and traffic issues, the conversion of downtown neighborhoods to 24-hour mixed-use districts with thousands of new residences requires a close look at transportation policies there. Rincon Hill and South of Market (SOMA) are experiencing a housing boom, and proposed changes in the Transbay neighborhood will change these areas from derelict industrial areas into vibrant, mixed-use neighborhoods. SPUR believes that now—before the emotions that accompany crises—is the time to take a step back and analyze the transportation system needed to serve the new uses that will develop in and around downtown over the next decades. If we do nothing, traffic congestion will worsen, and parking demand will again approach supply. Many observers believe that more parking equals less congestion, as if the cars will magically disappear into the parking garages, but in fact the opposite is true. The more parking you build, the more cars you attract and the worse congestion gets. The fringes of downtown,1 particularly in SOMA, contain many wide, multi-lane streets that were designed to move cars quickly through what was originally a primarily industrial area. Other streets, through the historic downtown and north and west, have been converted to one-way to speed traffic. These streets will have to change to accommodate their new uses as urban residential streets. The new residents will need wider sidewalks, with pleasant places to congregate. They will also need bike lanes to accommodate the growing number of people who prefer to use a bicycle for much of their transportation needs. Both wider sidewalks and bike lanes require space that is currently occupied by travel lanes that will have to be removed. While the space dedicated to moving motorized vehicles will shrink, the streets themselves will have to carry more people. Transit currently carries the bulk of person-trips downtown, and will have to shoulder an increased load of passengers if downtown growth is to succeed. Simply spending more money on more buses will not attract more passengers; in order to carry a substantially heavier burden, the buses must travel faster and be more reliable. Voters have supported this goal by specifying high standards for transit reliability and frequency in the City Charter (Proposition E, passed in 1999) but Muni is having a hard time meeting those standards. In order to improve reliability, the most important thing we can do is get the buses out of traffic, by constructing more transit-only lanes and strengthening transit-preferential treatment at intersections. Again, as in the case of wider sidewalks and bike lanes, transit-only lanes and enhanced transit preferential treatment come only at the expense of motor vehicle circulation. It is clear to SPUR that automobile capacity in the downtown will need to shrink in the wake of desirable transit, bicycling, and pedestrian improvements. SPUR welcomes these transformations to the downtown neighborhoods. It should also be noted that reducing automobile traffic to the downtown will help the neighborhoods as well, as traffic bound for downtown must in most cases travel through San Francisco’s residential and historic neighborhoods. In terms of specific transportation improvements downtown, SPUR supports wider sidewalks, from the wide public spaces recommended in the Redevelopment Agency’s Transbay Neighborhood Plan to the wider boarding areas recommended in Muni’s plan for Geary and O’Farrell St. bus stops. SPUR also recommends other sidewalk extensions throughout the district. SPUR also urges the creation of bike lanes and bike paths in order to make bicycling a realistic option for more people who will not ride a bicycle unless there is space dedicated for safe bicycle riding. SPUR would like to see dedicated bicycle space on Market St., the downtown’s most important bicycle corridor, as well as bicycle lanes or paths on more streets north and south of Market St. SPUR strongly supports the construction of the new central subway that will link the Third St. Light Rail to Chinatown and North Beach. The new Transbay Terminal is also essential to the future success of the downtown neighborhoods. Equally important, however, are the surface improvements, such as the improvements to Muni’s Geary and O’Farrell St. transit lanes that may serve as a model for other transit lanes. As described here, there are other places where transit-only lanes could make a big difference in improving transit so that the streets can carry more people more efficiently. Many of the improvements for improved transportation service and better livability of the downtown neighborhoods come at the expense of automobile capacity. Considering that an additional half million trips are projected to be made to, within, and through San Francisco every day2 by the year 2030, it is essential that we take measures to reduce the number of those trips that are made by automobile, at least at peak hours. If we do not succeed in reducing peak hour automobile trips, the peak “hour” will extend to most of the day, and the efficiency of automobile travel will reduce to a point that it threatens the economic vitality of the downtown neighborhoods. Taxicabs, delivery trucks, and essential personal automobile trips will be unacceptably delayed. The improvements will help transit, bicycling, and walking absorb a good number of the new trips. With the constrictions in automobile capacity on downtown’s streets, automobile speeds will likely slow even more, making transit, bicycling, and walking yet more attractive by comparison. However, more convenient alternatives and slower automobile speeds may not by themselves be sufficient to compel enough people to choose transit, walking, or bicycling over automobile trips in order to avoid crippling congestion. To create more livable downtown neighborhoods and preserve efficient automobile travel for those trips that are best made by car, San Francisco must better manage the cost and supply of parking, particularly commuter parking, to help reduce automobile travel downtown. Specifically, SPUR recommends strengthening some of San Francisco’s existing policies, stemming from the 1970s, that limit excessive parking supply. SPUR also recommends a new approach, changing how the City manages its parking supply from a project-by-project perspective to a more holistic neighborhood-based perspective that takes into account existing parking supply, transit, and roadway capacity, and livability goals of safer bicycling conditions and wider sidewalks. San Francisco has a new mayor who seeks to apply best practices in city management from around the world, and a Planning Department whose Commissioners are somewhat insulated from politics because they serve for a specified term, and cannot be replaced at the pleasure of the mayor or the Board of Supervisors. These conditions present a great opportunity to make important changes in parking and land-use policies and planning procedures that might meet a great deal of political opposition initially. Downtown San Francisco was founded before the automobile. Its streets were wide, by “old world” standards, to handle a large number of horse-drawn carriages. The wide streets later accommodated cable cars and light rail vehicles. Market St. carried thousands of passengers an hour on four sets of parallel transit tracks. With the rise of the automobile in the 20th century, and the systematic removal of transit systems by a consortium of oil, car, and tire companies, automobiles replaced public transit as the most prevalent mode of transportation by mid-century. Today, the automobile captures the majority of all trips in the city as a whole. The downtown, however, has mostly preserved its reliance on transit. Today, only a third of work trips to downtown are by private car, and roughly a third of those involve carpooling. Downtown has maintained its transit share through large public investments in transit and restrictions on commuter parking. From 1965 to 1983, in fact, 30 million square feet of office space were added to the downtown while vehicular traffic decreased by 3.7 percent.3 This reliance on transit is one of the main reasons San Francisco’s downtown is such an attractive place to do business. A typical employee in San Francisco’s downtown can meet all her needs—meeting with clients or colleagues, lunch breaks, personal errands at banks or retail shops—within walking distance of her job and transit station. Because automobiles are not necessary for the majority of trips downtown, the streets can remain convenient for use by taxis, delivery vehicles, buses, discretionary non-commuter automobile trips for such things as shopping, and bicycles. But the trend shows signs of weakening. The San Francisco County Transportation Authority (SFCTA) predicts that even with $30 billion in transportation spending over 20 years, including the new Central Subway, Caltrain extension and substantial bus rapid transit, there will be no appreciable improvement in transit service for most people and a quarter million new car trips every day, for an eight percent increase over the already high levels in 2000. The policy of discouraging new parking facilities has also been weakened. For example, despite the general plan’s recommendation for a “parking belt” around Market St., within which no parking should be built, three different parking garages with a total of 1,314 parking spaces have been approved or begun construction on Mission St. alone.4 The Mission St. buses represent the second busiest bus lines in the city. Mission St. at 8th St. is projected to “fail,” in the lexicon of transportation planners, with delays of over 80 seconds per vehicle at peak hour. The congestion predicted in official documents may be understated, in fact, if plans to improve transportation options and pedestrian conditions come to fruition. The next section details some of these plans, most of which reduce automobile capacity on the streets. The evolution of downtown San Francisco into an even more densely populated district, with round-the-clock activity, will be accompanied by some substantial land-use and transportation changes, especially in the South of Market area. As described in this report, sidewalks will be widened, bike lanes added, transit capacity increased, and blank storefronts activated. These changes will help to transform the district from one that has served primarily as an industrial district to one that is a pleasant place to live, recreate, raise a family, and do business. The changes listed below include a variety of transit, bicycle, and pedestrian changes that are necessary to support the new downtown. Most of these proposals, as you will see, reduce automobile capacity. While the inclusion of a specific proposal in the following list does not by itself constitute a SPUR endorsement, we strongly support the intention of each of the proposals and want to see them proceed. Accordingly, SPUR is calling on the Planning Department to take stronger measures to limit the growth of car trips, especially peak-hour car trips, to the downtown, as the demand for street space by these car trips is practically the only impediment to these very important transportation and land-use improvements. The improvements for the Geary St. bus lines, the city’s busiest, are representative of changes to surface streets that will make a big difference in transit times at the expense of automobile capacity. The plan includes curb “bulb-outs” at the bus stops; a much wider transit-only bus lane, with a greater level of enforcement; and one fewer mixed-traffic (i.e., buses and private vehicles in the same lane) lane (see Figure 1, p. 7). With the wider lane and new turn lanes enabling buses in the transit lane to pass other buses and trucks parked in or turning from the curb lane, buses experiencing traffic-associated delays will be minimized, and express buses will more easily be able to pass local buses. Transit travel times on Geary will decrease by 15 percent between Market St. and Van Ness Ave. While the Department of Parking and Traffic has determined that the reduction in regular traffic lanes from three to two at peak hour and two to one at other hours will not have a significant impact on traffic at this time, it does reduce the capacity for Geary to accommodate more automobile traffic in the future. Figure 1: The Percentage of Trips by Mode and Purpose to the Downtown (C-3) District. C-3 (downtown commercial) is defined by the Planning Department as “a center for city, regional, national, and international commerce” comprising four separate districts: C-3-0 (downtown office), C-3-R (downtown retail); C-3-G (downtown general commercial), and C-3-S (downtown support). It is bounded roughly by Washington St., Steuart St., Folsom St., Taylor St., Sutter St., and Kearny St.
Enforcement of the Mission St. transit lane (diamond lane) will improve performance of Mission St. buses, but reduce the (de facto) automobile capacity from two lanes to one, since private automobiles routinely occupy the diamond lane illegally. The Mission St. Muni buses have the second largest passenger burden of any bus line in the city. In addition, both SamTrans and Golden Gate Transit use Mission St. The proposed Van Ness Avenue Busway would remove as much as one third of the auto capacity of Van Ness from Lombard to Mission. This project is funded by the voter-approved half-cent sales tax. The project will remove at least two traffic lanes from the six-lane street, reserving those two lanes for Bus Rapid Transit. It will dramatically increase the number of people carried, from 5,000 people an hour currently to an estimated 24,000 an hour. The combination of flat contours and high density make the downtown neighborhoods perfect for bicycling. Yet, these streets are also some of the most dangerous, with very few bike lanes despite the high latent demand. While many people will not ride a bicycle in mixed traffic without at least the minimal protection of a bicycle lane, a network of streets with bicycle lanes not too distantly spaced can provide a transportation option for many whose only reason for not riding a bicycle already is the lack of safe streets. A bicycle lane was recently added to Howard St. east of Fifth St. Other potential bicycle lanes that are being considered in an ongoing planning process include Market St. from Octavia to Steuart St., Fifth St. and Second St. from Market St. to King St., Fremont St. from Howard St. to Harrison St, and Battery St. from Embarcadero to Market St. Almost every sidewalk south of Market is too narrow for the kind of pedestrian activity these streets will get. The sidewalks are 10' in width or less, next to multiple lanes of traffic. Typically, San Francisco's commercial districts have 15' wide sidewalks. The commonly cited cure of "bus bulbs" or "sidewalk extensions" to reduce the crossing distance for pedestrians is only possible if the curb lane is not used as a travel lane at rush hour, a common strategy to increase car capacity. 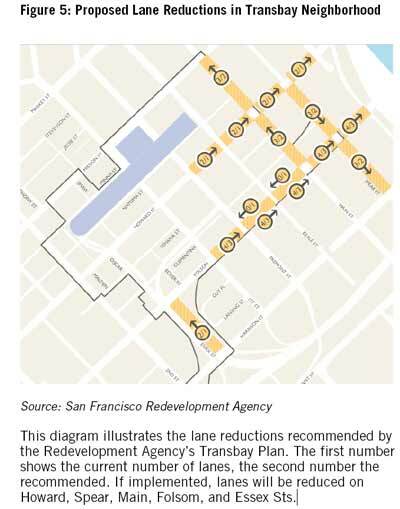 Recognizing the importance of wider sidewalks, the Redevelopment Agency's plan for the new Transbay neighborhood calls for deeper building setbacks and road narrowings (Figure 3, p. 9). The developers of other projects, too, are setting back the ground floor of their buildings to provide more pedestrian space. Further west on Folsom St., building on the Redevelopment Agency's proposals for the street, the nonprofit Public Architecture is advocating for a de-emphasis on automobile traffic for the sake of better transit, walking, and bicycling conditions. The proposal for Folsom St. works with the current level of traffic at non-peak hours. Midday traffic counts (from noon to 1:00 p.m.) registered only about 1,249 cars, for which two traffic lanes provide more than enough capacity. However, peak hour traffic counts (from 8:00 to 9:00 a.m., in this case) registered 2,386 cars. The demands on the street imposed by car-based commuting for just a few hours each day are making it difficult to transform the street to help it meet the needs of residents and visitors 24 hours each day. Pedestrian improvements on Sixth St. and on Seventh St. will consume traffic lanes (Figures 4 and 5, pp. 10 and 11, respectively). Congestion is a problem for numerous reasons. First, as noted, a high demand for automobile capacity on the roadways as demonstrated by severe congestion will hinder efforts to make improvements to other modes of transportation. Drivers expect a certain level of service from their roadways. If it becomes common to be stuck in congested lanes with speeds of 10–15 mph, next to apparently empty lanes reserved for buses and bicycles, political agitation against those lanes might cause policy makers to rescind the creation of the transit and bicycle lanes, even if those “empty” lanes carry more people than the automobile lanes, or provide the only option for safe bicycling in that corridor. Congestion also imposes direct costs today. For example, adding just a minute of delay due to traffic congestion to every Muni bus run along Mission St. increases Muni’s costs by $43,000 a year. The social costs are even higher, because bus delays also reduce reliability. With longer trips and less reliability, Muni attracts fewer passengers, creating a vicious cycle of reduced transit use and increased car use, that leads to increased congestion, more transit delays and less schedule reliability. 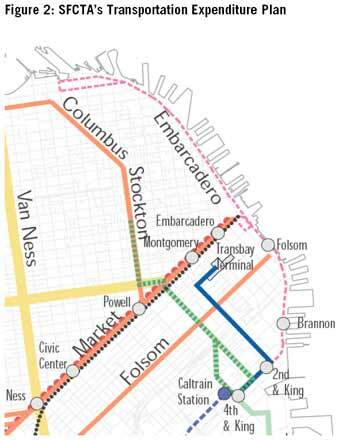 This plan shows planners’ desires to improve transit through exclusive transit lanes or transit preferential treatment on Van Ness, Market, Geary, Stockton, Folsom and parts of Third and Fourth Streets. Below are details on some of those projects. With congestion comes increased pollution; there is a predictable and dependent relationship between congestion and pollution. Automobiles sitting in traffic generate large amounts of air and water pollution.8 Reduced automobile idle time will reduce these pollutants. Reduced pollutants offer both short and long term health benefits to city residents. The most comprehensive look at downtown automobile congestion comes from the SFCTA’s Congestion Management Program. Numerous sections of roads in the downtown area, as illustrated in Figure 6 (p. 16), are currently experiencing delays of greater than 60 seconds, considered by transportation planners to be an unacceptable “level of service” (LOS)—in this case, LOS F. Such segments include portions of the Embarcadero, 6th St., 5th St., 1st St., Fremont, and portions of O’Farrell, Market, and Main Sts in the evening peak hours. Many remaining segments experience delays between 40 and 60 seconds (LOS D or E). Current congestion management procedures utilized by San Francisco merely focus on preventing severe congestion at specific intersections; they do nothing to reduce overall traffic levels. For example, when traffic engineers adjust the signal timing or turn-lane configurations at one intersection, more traffic impacts the next intersection in the grid. Figure 6 illustrates how these measures simply redistribute the traffic burden to alternate intersections and ultimately result in the decline in the overall performance of the downtown transportation infrastructure. Note the high concentration of segments that are just short of the failure rate (LOS E or F. LOS A is freeflowing traffic). While these types of traffic-mitigation measures typically implemented in San Francisco are helpful short term, clearly they are not a long-term solution to traffic mitigation; at some point all alternative intersections will be at capacity. Reversing this trend toward increased congestion will have positive influences on all other modes of transportation. Even with the addition of the proposed projected bicycle lanes, most bicycle travel will still take place in lanes shared with automobiles. Pedestrians use crosswalks across roadways, and, in busy shopping areas with low traffic, benefit from being able to cross the street mid-block or “against the light.” Congestion triggers impatience and aggressive driving, both of which can increase collisions with pedestrians and bicyclists. Decreased congestion creates a more hospitable and safe automobile, pedestrian, and bicycle environment. Transportation networks have an economically optimal level of automobile use, beyond which automobile travel has negative impacts on the local economy.10 The ways to reduce congestion are much simpler to explain than to accomplish. Simply put, congestion will be reduced when a sufficient number of people who currently commute by car choose a more efficient means of moving around—buses, bicycles, and walking. City planners in San Francisco and elsewhere are aware of the research into the factors that people consider when deciding how to travel. Translating that awareness into policies that discourage driving by managing parking is the goal of this paper. Another effective parking policy to limit peak hour congestion is to eliminate subsidies for employee parking. In May 2002 the State of California adopted the “parking cash-out” law that prohibits employers from offering free parking for their employees unless they offer those employees the option to accept cash in lieu of the cost of parking. The law applies to companies in counties that do not meet California air quality standards (all but two) and that do not own their employee parking spaces, but lease them from another owner on behalf of their employees. This program is very effective. In one study of eight companies (ranging in size from 120 to 300 employees with 1,694 employees total), after employees were given the option to accept cash in lieu of free parking, solo driving to work fell by 17 percent. Carpooling increased by 64 percent. Transit ridership increased by 50 percent. Walking and bicycling increased by 33 percent. Commuter parking demand fell by 11 percent. Through adjustments in price and supply of parking, we can reduce the commuter parking demand, and reduce peak hour traffic enough to implement the variety of transit, pedestrian, and bicycle improvements that will help downtown San Francisco to continue to flourish as it evolves into a vital 24-hour district. Implementation of the following recommendations will help reduce automobile travel demand, by providing the right amount of parking. Implementation and enforcement of most of these measures is the responsibility of the Planning Department. However, the Mayor’s Office, the Municipal Transportation Agency, and the SFCTA should also review and consider these recommendations. San Francisco’s limited street space can only accommodate so much traffic. There is no sense in providing parking for cars that cannot reach their parking space due to automobile congestion, particularly in light of the opportunity lost in developing that land for other commercial or public activity. The city should undertake the following actions before this recommendation is implemented. 1a. Study the impact of different types of parking spaces on peak hour congestion. Residential parking spaces in the downtown zone have the least impact on peak hour congestion, because most of the residents will walk to work, or walk to some of the transit service which is in rich supply in the downtown. Commuter parking spaces—those that provide discounts for all-day parking or those that are set aside specifically for employees in a building—have the biggest impact on peak hour traffic. Short-term spaces—those with price structures that penalize all-day parking and reward short visits—have a moderate impact on peak hour congestion. The City should carefully study each type of parking space, and assign a value that corresponds to the degree to which each type of parking space causes peak hour congestion. 1b. Create a limit on the total number of parking spaces that can be placed in a certain subarea, with respect to different types of parking. The downtown study area should be divided into sub-areas and the amount of parking in each sub-area should be limited to the capacity of the streets in that area. It should be noted that the parking spaces’ contribution to peak hour traffic is what matters; to the extent residential parking replaces commuter parking, the actual number of parking spaces established under the limit can be increased. This would require detailed and sophisticated traffic studies, but current traffic models are developing that capacity. 1c. Adjust the optimum limits every decade as travel patterns change and land use and transportation patterns also change. Over time, we may find that the travel patterns of residents, visitors, and employees change. Parking intended for short-term use may be used more and more by commuters willing to pay the premium. Residential parking may have even less an impact on peak hour congestion as more downtown employees choose to live in the same district as their job. This is what happened in Vancouver, where downtown residential development resulted in a reduction in car commuting to downtown.17 The city should be sensitive to these changes by adjusting the parking limits each decade, based on studies of travel and parking patterns. Once the optimal levels of parking supply are determined, the City should adjust its zoning codes and development approval procedures to keep the amount of parking provided as close to these optimal levels as possible. In areas where the optimal levels of parking are greater than the amount provided, existing controls would apply. The following are suggestions related to parking supply and price that the City should consider, when the parking proposed exceeds the optimal levels. SPUR believes that parking requirements should be related to the capacity of the streets to handle traffic. SPUR recommends that the following specific recommendations to accomplish this goal be subject to more public review, comment, and appropriate modification before being adopted. 2a. Require conditional use approval process for parking, including otherwise permissible parking, that exceeds the area-wide limits. 2b. Make parking supply above otherwise permitted amounts a prohibited use, if such parking exceeds the area-wide limits. These two recommendations do not change the approval process for parking that is otherwise permissible and whose addition to the neighborhood does not cause the overall parking supply to exceed the optimal limits set by the City. For parking proposals that do lead to an excessive supply, the recommendations lead to greater scrutiny in the case of otherwise permissible (“by right”) parking and prohibition in the case of nonaccessory parking. 2c. Establish a system of transferable parking development rights administered like the transferable development rights. In the areas where the optimal parking supply exceeds actual existing supply, property owners could add more parking with relative ease. However, it would result in a first-come, first-served policy that rewards the first developers to build parking and penalizes those who don’t. To level the playing field, the City could apportion the right to build parking among the parcels in an area, and landowners could buy and sell these transferable parking development rights much as existing transferable development rights are bought and sold. 2d. Eliminate minimum parking requirements for new housing. This recommendation is already included in most of the planning proposals related to downtown, including the Transbay development plan and the Rincon Hill plan. SPUR supports these proposals so that housing can be more affordable and better meet the diverse needs of current and future San Francisco residents. 3a. Implement parking cash-out programs at subject employers. The state’s “parking cash-out” law, which eliminated hidden subsidies for employee parking, is not being enforced. The Board of Supervisors should pass a local ordinance clarifying the law in San Francisco and insisting on its enforcement. The City of Santa Monica requires proof of conformance with the cash-out law as a condition of issuance of a building permit. The San Francisco Assessor could require proof of compliance as part of annual property tax collections. 3b. Unbundle parking costs from housing costs for housing projects of a certain minimum size. The lease or sale of housing should be legally mandated to exclude a parking space as a part of the purchase price. Parking spaces should be priced separately. This will increase the affordability of housing, reveal to consumers the true cost of parking, and allow households who do not own cars to avoid hidden parking costs. Smaller developments of fewer than 10 or 20 units should be exempt from this provision. 3c. Institute a surcharge for entering and exiting a parking facility at times of peak congestion. A surcharge that applies to the parking fee when the vehicle leaves or enters a parking garage at a peak hour would have the most direct effect on discouraging peak hour commuter traffic. Many cities are experimenting with mechanisms to tax commuters who contribute to peakhour congestion. Most recently London has applied a fee to driving within a central area cordonline during peak hours. In the 1970s Singapore first required a downtown-driving permit for automobiles that drove or parked downtown during peak periods. 3d. Increase the parking levy. Increasing the parking tax would be a more general disincentive to driving, and perhaps equally importantly, generate much needed revenue to the city. San Francisco’s current tax rate of 25 percent generated $50 million during FY 2002–03. The Charter distributes 40 percent of the revenue to the Municipal Railway, 40 percent to the General Fund, and 20 percent to the General Fund dedicated to senior services. These mechanisms aim to charge commuters for their contribution to peak period congestion. They could be levied as a tax which would require approval by two-thirds of the voters in a ballot measure (unlike when the tax was originally imposed in 1981). Another alternative is to levy these charges as a fee, like San Francisco’s transit assessment, which is a fee on developers for a development’s demonstrable impact on transit operating costs. To levy a parking fee, the Board of Supervisors would have to conduct a study to determine the impact on the transportation system’s operating costs imposed on by each parked car, and limit the fee to that amount. 3e. Apply a parking impact development fee in addition to the transit impact development fee. Currently, the City applies a transit impact development fee to new development in the downtown area to recoup some of the costs of providing transit service. There is no “parking impact development fee,” although the provision of parking impacts the city with costs related to congestion. As for recommendations 3c and 3d, imposition of such a fee requires a study to assess the correct amount. The City of Palo Alto is currently conducting a multi-modal transportation impact study to determine the level at which they should set their transportation impact development fee. 3f. Price all on-street parking. Much of the on-street parking in SOMA is still unregulated, and therefore provided free to users. SOMA streets should be brought in line with basic parking management strategies elsewhere in the City. Meters should replace free spaces. The Department and Parking and Traffic will have to allot funds from their budget to finance the placement of more meters on these streets. The meters, however, will quickly generate income to more than compensate for their costs. In addition, each Parking Control Officer generates a net revenue for the City. 3g. Offer reduced parking rates for carpool commuters. This measure is already happening and should be increased. 3h. Exempt City CarShare parking spaces from fees and taxes. Many San Francisco parking garages currently offer a reduced rate for commuters who participate in a carpool. Additionally drivers who participate in car sharing programs are often offered similar discounts. Car-sharing pods should be given a set number of free parking spaces at City-owned garages. 4a. Update data used to calculate transportation demand in the environmental review process. The city’s current method of determining transportation demand relies on historical data to predict the modes people will use to access downtown destinations. This calculation, contained in San Francisco Guidelines for Transportation EIRs, is flawed because it assumes that mode split will remain constant, regardless of the provision of parking or transit improvements, new bicycle lanes, or changes in land use. Amazingly, it assumes that an office building with 1,000 employees and 10 empty parking spaces within walking distance will generate as many car trips as the same building with 1,000 empty parking spaces within walking distance. It is also flawed because the historical mode split data it relies on is derived from the Citywide Travel Behavior Study, which is 10 years old, and not exact in terms of neighborhood. Because it divides the city into four simple quadrants, for example, it assumes that the trip generation rate of a building at 16th and Mission is the same as one in Ashbury Heights. The Planning Department should update its San Francisco Guidelines for Transportation EIRs to take into account potential changes in people’s mode choices based on potential changes in the transportation infrastructure, as well as the benefits of development near transit. 4b. Add parking reduction as a favored traffic mitigation measure in the environmental review process. Most new developments that require environmental impact reports are found to generate a level of automobile traffic that lowers the LOS at some intersections to an unacceptable standard. Currently the Environmental Review Section of the Planning Department will work with traffic engineers to determine appropriate traffic mitigation measures that will prevent traffic at any intersection from earning a failing LOS rating. These measures include such things as changing the length of traffic signals, widening roads, or redirecting the flow of traffic. As illustrated earlier in the paper, these methods simply shift traffic to alternate intersections, which lowers the overall performance of the transportation network. SPUR instead recommends that a reduction in parking supply serve as a favored traffic mitigation measure during the environmental review process. In San Francisco, an excess or deficit or parking does not constitute an environmental impact. However, reduced parking would mitigate the automobile traffic at all impacted intersections. In fact, traffic impacts would be reduced on the entire transportation network, not just the specific intersections that are nearing failure rates. Mitigation measures are ultimately an administrative decision by the Planning Department. The Environmental Review section of the Planning Department should propose changes to the guidelines to the Planning Commission. The new guidelines should specify, for instance, that some level of reduced parking in a project would reduce the trip-generation rates of that project, and therefore wholly or partially mitigate the negative impacts of congestion that could be caused by the project. 5a. Develop parking locator tools for visitors and shoppers. Frequently drivers lament that much of urban congestion is a result of drivers looking for parking. There is no evidence to support or refute this point, however transportation planners have developed effective means of communicating information about parking availability and prices to drivers. These methods include postings on the web, and electronic signage on freeway off-ramps, highways, urban streets, and on the parking lots themselves. The Parking Authority should establish a parking management system with real-time information and way-finding signs. Signs should be strategically located to direct drivers to nearest parking and agglomerated so they do not clutter the streetscape. Additionally, Internet services, such as parkingquest.com, which allow drivers to pre-plan and reserve parking spaces could also reduce any circling congestion. We must be careful that these tools do not send the message to commuters that parking is easy and available. These tools should be applied primarily to short term parking. 5b. Manage City government automobile fleet more efficiently and cost-effectively. City departments should stop offering free cars as perks to employees who do not need them. Dedicated vehicles should be replaced by a fleet, with per-use departmental charges. The Board of Supervisors and the Mayor’s Office should prohibit new car purchases in all departmental budgets. Additionally they should phase out the existing fleet and encourage the use of car-sharing services. There are a number of plans, official and unofficial, that will contribute to making downtown San Francisco succeed as a mixed commercial and residential neighborhood. These plans will create a wonderful environment for walking and recreating and convenient options for transportation so that an even larger majority of visitors to and residents of the district will not need to use a car. These plans need our support. This paper sets out some recommendations that will help these plans come to fruition by reducing the incentives to drive and the concomitant traffic congestion that threatens the success of these plans. SPUR seeks allies to implement these recommendations from the potentially large alliance of people who want to see San Francisco’s downtown to continue to grow and thrive. These advocates for a less car-dependent downtown can come from downtown business interests who desire continued mobility and access despite a large increase of people; to protectors of the Bay Area’s greenbelt who desire less pressure for vastly wasteful suburban sprawl; to affordable housing developers who want to build more housing at lower cost; to advocates for affordable living without a car, who desire to create more opportunities for people of limited incomes to have access to the rich choices of urban life; to environmentalists who seek to reduce the pollution caused by automobiles; and to neighborhood advocates who want improved access to downtown without having to fight traffic, or watch traffic levels increase in their neighborhoods. 1We define “downtown,” for this purpose, as the area adjacent to and south of Market St., and north of Townsend and Division Sts., from the Embarcadero to Van Ness St.
2Total trips increase 12 percent, from 4.5 million to 5 million by 2030. (SFCTA Countywide Transportation Plan, p. 34). 4 These include a 504-car facility at 1160 Mission St. between Seventh and Eighth Sts., a 410-car facility at 301 Mission St. a mere block from the Transbay Terminal, and a 450-space underground garage across from Yerba Buena Gardens. 5The City of London achieved a 40 percent improvement in reliability and similar reduction in transit delays by the establishment of transit preferential lanes in the outer districts and through an $8/day congestion charge on automobiles in the inner core. 6 SFCTA Market St. Study Action Plan, pp. 12-13. "Prohibiting cars in the center lane will increase congestion in the curbside lane, which can be mitigated by reducing automobile volumes. Such a forced turn will have impacts to traffic on Mission St. and other downstream streets. Available at www.sfcta.org/documents/ACTIONPLAN.pdf. 7According to Communities for a Better Environment, about a third of the pollution in San Francisco Bay is street runoff, comprised of a toxic cocktail of heavy metals (copper from brake pads, highly toxic polycyclic aromatic hydrocarbons, and exotic trace chemicals from the manufacturing of car tires). 9Fifty of seventy-one intersections in environmental impact reports for projects approved in the downtown area over the last ten years showed intersections at level of service "F" or worse. 10Economic Development Impacts of Transportation Demand Management. Todd Litman, Victoria Transport Policy Institute, May 2002. http://www.vtpi.org/tdmecodev.pdf. 11"Parking Fare Thresholds: A Policy Tool." Tsamboulas, Dimitrios. Transport Policy, 2001, Volume 8, P115-124. 12The 1987 Evaluation of Transportation Management Programs, Final Report, Mike Lent and Elizabeth Rankin, Seattle Commuter Services, 1987. 13Congestion Management Program 2001. San Francisco County Transportation Authority, November 2001. 14"Factors Affecting TDM Programs? Effectiveness at Six San Francisco Institutions," Dr. Richard Dowling, Dowling Associates, paper before the 70th annual meeting of the Transportation Research Board, January 1991. 16Parking Supply Management. Federal Transit Administration, Department of Transportation. 17 Schiller & Kenworthy, World Transport Policy and Practice, p. 33. This report was written by the SPUR Transportation Committee, Dave Snyder, committee chairman and principal author. Kearstin Dischinger, as an intern for Transportation for a Livable City, researched and wrote portions of the paper. The paper was studied, debated, and edited by the entire SPUR Board, and adopted as official SPUR policy on October 20, 2004.